Today’s artist from the exhibit Two Centuries of Black Art is Joshua Johnson. You probably get sick of hearing me say “I’m a big fan of…” but I don’t say what I don’t mean when it comes to art. I’m a big fan of the indigenous, self-taught artists of the world. I’m happy that in the last twenty years, museums have started recognizing what used to be called “primitive” or “folk” art. Now it is referred to as “visionary” art, although I have trouble with that term, as well. Because there were no official art schools/academies in the US until 1805 (Pennsylvania Academy of Arts) or 1825 (National Academy of Design, New York), there was a propensity of self-taught artists in the early United States. If it was hard for white colonists to acquire artist training, then it was doubly or triply hard for African Americans, even if they were free. Joshua Johnson is thought to have been the first African American to become a professional painter and make a living from his art. Born as a slave around 1763 of a white father and black mother, Johnson was purchased (awful term!) by his father when about a year old. He was apprenticed to a blacksmith in Baltimore and freed in 1782. It is believed that he developed his style through his own keen perception of nature and art. 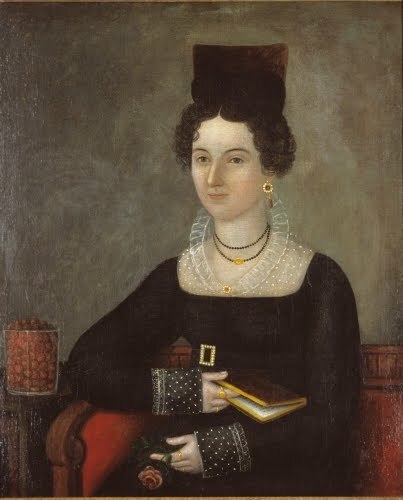 Although there are no records of his painting education, Johnson may also have been influenced by the style of Charles Willson Peale's (1741–1827) nephew, the Baltimore portraitist Charles Peale Polk (1767–1822), whose naïve style Johnson’s resembles. As of 1796 he advertised himself as a portrait painter and limner (itinerant painter). Like other itinerant painters, he traveled a lot, often relocating to areas where there were other artists, especially chair makers, which suggests he may have taken on such work to supplement his portrait income. The series continues tomorrow with the work of Aaron Douglas.